Friends.. 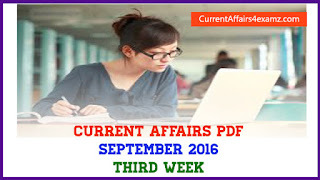 Here is the Top Current Affairs Questions for 27 August 2015 covering all important aspects for upcoming Bank/UPSC/SSC Exams. We have prepared this Multiple Choice Quiz in the exam format. You can attempt the Quiz and check your score in real time. Attempt and share your score. 1) As per the 2011 census data on religion released by Union Government on 26 August 2015, ___% of the population in India are Hindus? 2) Finance Minister Arun Jaitley inaugurated Bandhan Bank as a full-fledged scheduled commercial bank on 23 August 2015. It will be head quartered at? 3) Union government recently launched a telemedicine initiative named? 4) Justin Wilson who died recently after suffering a traumatic brain injury was related to which sport? 5) Naval Singh who was awarded Dronacharya Award 2015 was related to? 6) Justice Madanlal Laxmandas Tahaliyani was recently sworn-in as the new Lokayukta of? 7) India and which country have recently inked a Memorandum of Understanding (MoU) for the construction of Raxaul-Amlekhgunj oil pipeline? 8) Who was recently appointed as the Chairman of India’s Oscar jury by Mumbai based Film Federation of India (FFI)? 9) Which state will house world's largest 750 Mega Watts(MW) solar power station in Rewa district? 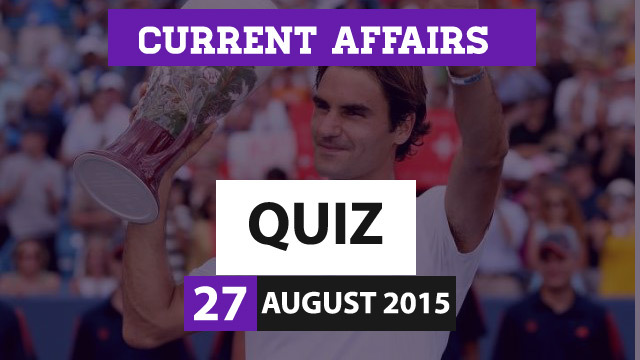 10) Who among the following has won the Cincinnati Masters Tennis title for record seventh time in men’s singles?